Experience wonderful detail in a compact size. Our 60mm and 70mm scopes feature PC-3® phase- corrected BaK-4 roof prisms with fully multi-coated optics for extra-sharp, extra-bright and brilliant color resolution at the longest ranges. Utilizing the latest Bushnell® technology these scopes deliver a clear, bright image regardless of weather conditions. Ideal for traveling, birders, backpackers and big-game hunters, the compact Elite® spotting scopes offer full-featured performance in an easy to handle, 100% waterproof/fogproof/shockproof package. 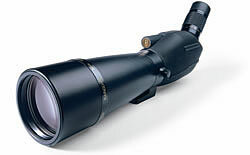 Both of our 80mm Elite® spotting scopes are engineered with only the finest materials. With ED Prime Extra-Low Dispersion Fluorite glass and premium BaK-4 porro prisms, they offer extraordinary brightness and color fidelity. ED Glass delivers amazing color resolution and contrast, and virtually eliminates chromatic aberration and color-fringing to bring out the most distinct details possible in low-light conditions. From bull elk on a snow-covered mountain to birds on a wind-swept beach, the Elite is an easy choice for optimum viewing. Optional accessories include a 22x long eye relief eyepiece (78-2200), a 30x eyepiece (78-3000) and a special camera adapter (78-0050). Our finest scope with a 45° eyepiece.